In 1993 Howard Rheingold wrote a remarkable book called The Virtual Community. In this book he gives what might best be called a personal account of the expanding culture of people communicating via computer networks. I asked him some questions about the relationship between virtual and traditional communities, most appropriately, via e-mail. 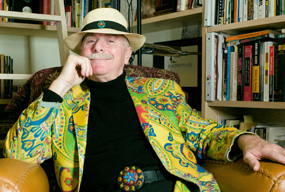 Howard Rheingold has been publishing books and articles on computer culture for many years. He is the multimedia columnist for Publish magazine and editor of Whole Earth Review. He has also been a consultant to the US office of Technology Assessment, and recently he took charge of Planet Wired a network project that will document the digital revolution with local examples, made accessible via the Net to a world-wide audience. More than merely informative, his book The Virtual Community is above all a highly personal account of the way in which people are using computer networks as communication devices, or rather how they are engaging in Computer Mediated Communication (CMC), the term Rheingold prefers. Rheingold maintains that Computer Mediated Communication creates a new sense of community; people from around the world are linked together in public discussions, people who exchange ideas and messages, share interests and work together, outside of the constraints of geographical space and across social barriers. In his book he provides us with a somewhat formal definition of virtual communities, which he describes as “social aggregations that emerge from the Net when enough people carry on those public discussions long enough, with sufficient human feeling, to form webs of personal relationships in cyberspace”. Rheingold has himself been actively involved in one of the early network communities in the US, The Well, based in San Francisco. Using networking technologies within the context of traditional geographic communities produces Community Networks. I began by asking Rheingold to explain his understanding of this phenomenon.